Every car owner must know about the existence of the instrument dial or indicator that indicates the level of pressure in the lubrication system. Purpose this indicator is displayed on the dashboard — the most visible place of your car. To avoid breakage, every driver needs to constantly monitor the readings of this indicator. Warm engine to operating temperature (over 60 degrees). Turn off the engine and remove the pressure sensor, which is usually located in the cylinder head. Attach a suitable size pressure gauge to the system instead of the sensor. To connect use the adapter with different diameters. Start the engine and remove the pressure gauge at different rpm operation of the engine. Again, turn the engine off. Disconnect the manometer, when the pressure of oil in the system drops to zero. Install the pressure sensor in place. Compare readings with the values declared by the manufacturer of the engine, and make the appropriate conclusions. The excess pressure in the system may lead to the expulsion of motor oil through the seals. To prevent this, the engines provided a pressure-reducing valve, which if excessive (usually more than 4-5 bar) pressure diverts part of the oil back to the pump inlet. Therefore, the oil flow through seals and other seals can be directly linked to the failure of such valve. Low pressure in the system can lead to much more heavy for the engine effects. Thanks to sufficient pressure oil to all friction parts of the engine, ensures proper operation and prevents premature wear. The reduction of the pressure in the lubrication system can be caused by leakage of motor fluid within the system or the wear elements in the oil pump. You can also observe the opposite phenomenon, when the pressure drop caused by wear of rubbing parts, in particular bearings of the crankshaft. When wear increases the gaps, so the engine oil starts to flow through them. To prevent unwanted effects in the engine system check engine oil pressure. Perform this procedure using the special tool pressure gauge. Why do that when there's a handy indicator on the instrument panel? 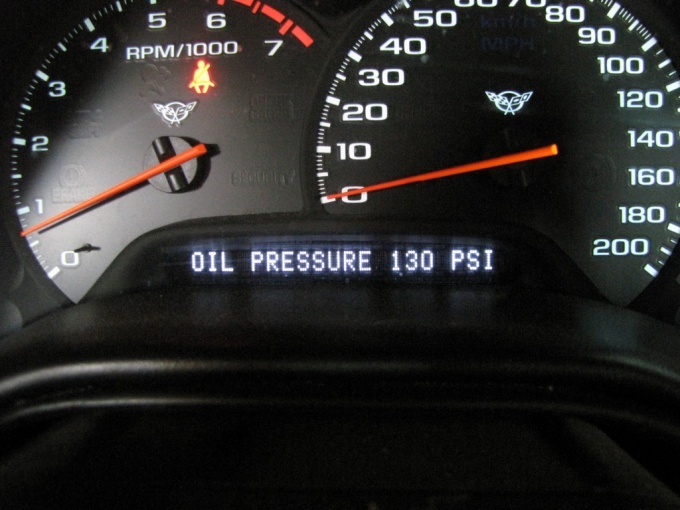 The fact that this indicator only indicates that the oil pressure has dropped below minimum allowed value. It is not necessary to trust the arrow indicators, they are not always able to correctly display the status in the system. In addition, there is a likelihood of a fault condition of the indicator or sensor that transmits information.